The White Flowering Currant is a thick stemmed and twigged, deciduous shrub that produces dark green leaves, with clusters of small white flowers emerging from November to March. 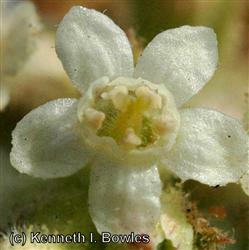 It frequents Canyons and crevices, providing color when few other plants are blooming. The flowers and leaves produce a pleasant fragrant smell. This currant survives the drought conditions of summer by dropping its leaves during the hottest months and springing back to life in winter. It grows naturally among the scrub oaks and other chaparral shrubs so if possible provide some dappled or partial shade and no summer irrigation.